This product is no longer available and has been replaced by: LoggerLink. Archer-PCon provides a portable data collection solution for Campbell Scientific data acquisition systems. It consists of Juniper Systems’ Archer Field PC, Campbell Scientific’s PConnectCE Datalogger Support Software, and the hardware required to connect the field PC to a Campbell Scientific data logger. The ultrarugged Archer Field PC ensures that your data is safe—even in extreme environments. With an IP67 sealed rating, it is completely sealed against dust and water. And it won’t break down or fail in extreme temperatures—it is made to operate in temperatures as cold as -30°C or as hot as 50°C. PConnectCE software supports communications between the Archer Field PC and a Campbell Scientific data logger. The software allows you to collect, graph, and display the data logger data; set data logger flags, ports, and clock; and transfer data logger programs. Shockproof Survives multiple drops from 1.5 m (5 ft) onto concrete. CompactFlash (CF) One type-1 or type-2 CF card fits into the CF card slot. Use only industrial-grade CF cards with a storage capacity of ≤ 2 GB. Secure Digital (SD) One SD card or Secure Digital Input Output (SDIO) card fits into the SD card slot. Expected Life Operates for more than 20 hours on one charge. Time to Recharge Charges in 4 to 6 hours. Does the Archer-PCon Field Data-Collection Package come with PConnectCE software? Yes. The Archer-PCon package includes PConnectCE software. The PConnectCE manual includes instructions for installing the software. When PConnectCE is used to collect data from a data logger to a PocketPC or Windows Mobile device, why is the file stored as a BDF file instead of a DAT file? Data files are stored on the PDA in a binary format with a .bdf extension. When they are transferred during the hot sync process, PConnectCE converts them to comma-separated ASCII. The collected data files must be saved in the My Documents folder on the PDA; if not, the conversion process does not take place. The files are transferred to the PC in their original format with a .bdf extension. Try copying the BDF file back to the PDA in the My Documents folder. Then perform the hot sync again. If the file has not been corrupted in the copying process, PConnectCE should find it in the appropriate directory during the next hot sync and perform the conversion. The files are also transferred in their original format if a process other than PConnectCE transfers the file before PConnectCE is able to transfer it. To resolve this issue, disable any other processes in ActiveSync/Windows Mobile Device Center that may be transferring the file. After resolving the issue, try copying the BDF file back to the PDA in the My Documents folder, and perform the hot sync again. Is Archer-PCon compatible with Windows 7 software? 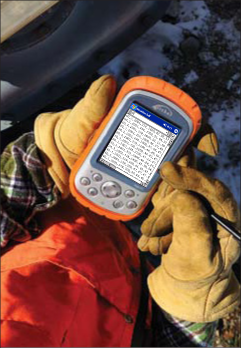 The Archer-PCon Field Data-Collection Package consists of Juniper Systems’ Archer Field PC, Campbell Scientific’s PConnectCE Datalogger Support Software, and the hardware required to connect the field PC to a Campbell Scientific data logger. PConnectCE was not developed to run on Windows 7. Therefore, some additional steps are needed to get PConnectCE running correctly on a Windows 7 PC. There are two issues with PConnectCE and Windows 7. One issue is that, starting with Windows Vista, Microsoft declared ActiveSync obsolete and began shipping the Windows Mobile Device Center instead. The other issue involves the User Account Control (UAC) feature in Windows. Start installing PConnectCE for a second time. When a message appears asking if the software should be run in compatibility mode, choose Yes. The installation will continue. Everything should work correctly after the installation is finished.